The Adventures Of Tintin is the innovative and visually stunning film brought to you by the ingenious partnership between legendary American director Steven Spielberg, and renowned New Zealand producer Peter Jackson. 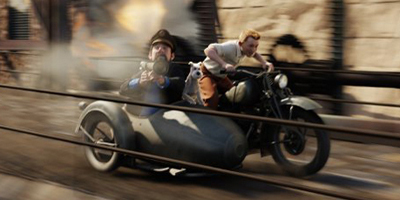 The film was ingeniously adapted from the original comic book The Adventures Of Tintin: The Secret Of The Unicorn by the Belgian artist Hergé, in motion capture, allowing your favourite and well loved Tintin characters to come to life. The story begins with our protagonist Tintin (voiced by Jamie Bell), the avid reporter whose curiosity is never sated, when he purchases an old wooden model ship called The Unicorn in a marketplace. However, this beautiful model contains a deadly secret, and soon Tintin finds himself dragged in to a quest for treasure that has raged for centuries. Treasure for which people have both killed and died for, and if Tintin isn't careful, he'll be next! 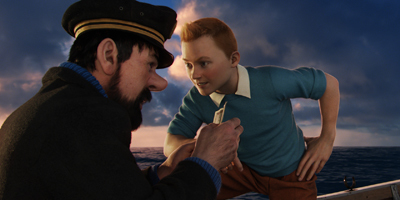 Enlisting the help of his trusty dog Snowy, the drunkard Captain Haddock (Andy Serkis) and the twin investigators Thompson and Thomson (Simon Pegg and Nick Frost), Tintin must now go to the ends of the earth in order to collect all three clues hidden within the three identical model ships. Clues which will lead him to the legendary treasure of Sir Francis Haddock, the ancestor of Captain Haddock, who sank his treasure-laden ship to stop it from falling in to the hands of the infamous pirate Red Rackham. Travel the world with Tintin and his companions in his quest to uncover the truth behind Sir Francis Haddock's treasure and discover its whereabouts, in this incredibly thrilling and visually breathtaking film. -C.E.